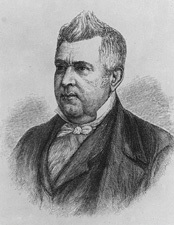 CLAYTON, John Middleton, (nephew of Joshua Clayton, cousin of Thomas Clayton, and great-granduncle of C. Douglass Buck), a Senator from Delaware; born in Dagsboro, Sussex County, Del., July 24, 1796; pursued preparatory studies at academies in Berlin, Md., and Milford, Del., and graduated from Yale College in 1815; studied law at the Litchfield Law School; admitted to the bar in 1819 and commenced practice in Dover; member, State house of representatives 1824; secretary of State of Delaware 1826-1828; elected as an Anti-Jacksonian to the United States Senate in 1829; reelected in 1835 and served from March 4, 1829, until December 29, 1836, when he resigned; chairman, Committee on the Judiciary (Twenty-third and Twenty-fourth Congresses); chief justice of Delaware 1837-1839; elected as a Whig to the United States Senate and served from March 4, 1845, until February 23, 1849, when he resigned to accept a Cabinet position; Secretary of State in the Cabinet of President Zachary Taylor 1849-1850; while Secretary of State negotiated the Clayton-Bulwer treaty with Great Britain; again elected as a Whig (later Opposition Party) to the United States Senate and served from March 4, 1853, until his death in Dover, Del., November 9, 1856; interment in Presbyterian Cemetery. American National Biography; Dictionary of American Biography; Comegys, Joseph. Memoir of John M. Clayton. Wilmington: Historical Society of Delaware, 1882; Wire, Richard. John M. Clayton and the Search for Order: A Study in Whig Politics and Diplomacy. Ph.D. dissertation, University of Maryland, 1971.